A holiday without any kind of booze isn’t a holiday, unless you lead a sober life. With a great variety of cocktails and drinks, it’s not easy to choose what booze to serve at your Christmas party. Jello shots are fantastic, but not for everyone. Classic vodka may be too strong and simple cocktails like eggnog may be too boring. The way out? Toast the holiday with these seven boozes and feel free to add your own ideas after reading through. Many wellness experts claim that red wine is one of the best beverage choices at any party. When you drink it in moderation, red wine is incredibly good for you. It contains a number of health-promoting compounds that help to improve your heart health and keep you younger longer. One glass of red wine will be enough to enjoy your Christmas party and wake up healthy the next day. Say no to hangover. If you want more, opt for two glasses but no more. If you don’t like red wine, and want to have something lighter than classic vodka, opt for vodka soda with fresh lime or cucumber. Vodka is sugar-free, gluten-free, and low in calories. Combine vodka with soda water, and add in lime, lemon or cucumber slices to make your cocktail tastier and healthier. Both lime and cucumber are excellent sources of vitamins. Mint is a great option too. This type of beer has incredible anti-inflammatory and antioxidant properties that many alcoholic beverages don’t contain. Surely, it doesn’t mean you can drink as many glasses of fermented apple cider as you want. Excessive consumption of it causes more harm than good. 1-2 glasses will be enough for you. Organic tequila is less harsh and has more unique flavors than vodka. Instead of downing tequila as a shot, sip on it. It sounds ridiculous, but this way you won’t get drunk fast and have minimal to no hangover. You can add a slice of lime or lemon to it for a refreshing flavor. Fruit-infused tequila isn’t the best choice unless you use fresh fruits. Fruit-infused tequila is typically loaded with sugars and causes severe hangover. Pomegranate juice is nutrient-dense while gin is sugar-free. The combination of these ingredients makes festive Christmas beverage. Add a slice of lime and soda water to it if you crave something lighter. Gin contains natural ingredients like coriander, cassia, sage, nutmeg, rosemary, fennel, or cinnamon, making it a perfect addition to a great number of holiday cocktails. This is one of my favorite Christmas cocktails that I usually serve at the party. It’s quick and easy to make and requires simple ingredients. Combine vodka, orange juice, chilled cranberry tea, lemon juice and sugar (or skip it), shake and enjoy. I make the cocktail without sugar, but if you have a good relationship with sugar then add 2-3 teaspoons for 2 cocktail glasses. Plain red wine is healthy, but many people have it on a regular basis so adding all sorts of Christmas-themed spices to it can make a big difference. Mulled wine is a traditional winter drink that is tasty but not healthy since it contains sugar. 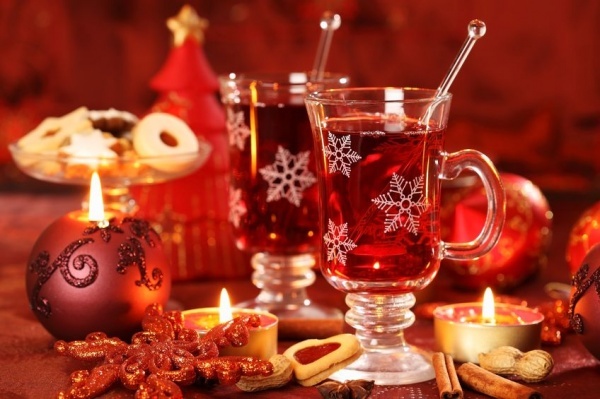 Mulled wine is ideal for small parties and romantic parties of two. You can add your own ingredients to create a brand new version of classic winter drink. There are plenty of traditional Christmas cocktails, albeit if you get more creative you can make even more boozes. Be mindful of your alcohol consumption, otherwise you will miss the Christmas party and spend the next day dealing with severe hangover. Have a merry Christmas week and make sure you host the best party of the year! Don’t forget to share your Christmas drink ideas in the comments.